Rose dinnerware is plentiful, in both fine china and casual dinnerware sets. Rose designs are very popular. Because the dinnerware patterns are timeless, many of the rose patterns become collectibles that dinnerware collector's love to display. Personally, I love roses because of the feminine look that they bring to the surroundings. To me, the color or type of the roses doesn't matter much. I just adore them and find them irresistible. The Old Country Roses pattern of dinnerware of the Royal Albert brand is known as the best selling dinnerware pattern in the world. The pattern was originally introduced in 1962. Harold Holdcraft designed it and the design was inspired by flowers in bloom in an English country garden. There are many dinnerware and serving dishes available in the Old Country Roses pattern . If you like the pattern, I suggest checking them out. Over the years, this pattern has been produced in bone china in various shapes and alternate patterns. It has also been licensed to be produced in home items that are not necessarily dinnerware, so the pattern can be enjoyed throughout the home. Christmas dinnerware in the Old Country Rose pattern is available as well, along with anniversary dinnerware that collector's would love to have. A collector's guide will help you to determine the history of your dinnerware. Another collectible pattern of rose dinnerware is the Franciscan Desert Rose dpattern. It was introduced in 1941 and is one of the two Franciscan dinnerware patterns that are still in production. It is known as the best selling dinnerware pattern in the United States. Originally, this pattern was made in the USA, but over the years its production has been produced in various countries. An interesting tidbit of information is that this pattern was used in the White House. It was the choice of casual dinnerware by First Lady Jacqueline Kennedy. This dinnerware pattern is embossed dinnerware that is hand-painted, which just adds to the charm. There are many matching accessories in this pattern to choose from. By using a collector's guide , you can determine the era and location of production. Rose dinnerware is very popular and in demand. There are many patterns to choose from in casual dinnerware sets. The French Quarter pattern by Pfaltzgraff is quite original. It simulates a New Orleans courtyard garden with gentle shades of green and terra cotta featuring rose-colored buds. It is really gorgeous. The Kathy Ireland Home Blossoming Rose is very attractive. It brings the beauty of an English rose garden to the table with charming, vibrant rose blooms. If rose buds dazzle you, you are sure the love the Caleca Pink Garland pattern. It is very dainty and delicate and brings a romantic flair to your kitchen table. The Corelle Blushing Rose patterns is very fashionable and modern in a square dinnerware set. I love red roses, and I find this pattern to be astounding. The Tea Rose dinnerware pattern by Pfaltzgraff is fabulous for a casual dinnerware set. Scalloped edges and the delicate beauty of watercolor roses add grace to every dining occasion. Fina china dinnerware patterns with roses are plentiful because rose patterns are a favorite for setting a fine dining experience. 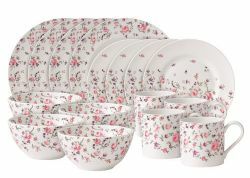 The Royal Albert New Country Rose pattern is simply stunning. It comes in various versions of the pattern to meet the expectations of modern dinnerware lovers. The Spode Christmas Rose is a wonderful setting of English white bone china. The Victorian rose is set in a holly borders with gold trim. Although the rose is a Christmas rose, it is good for fine dining year round, including use for Christmas dinnerware. The Royal Albert Moonlight Rose pattern is my favorite, but I am little bit partial because this is the dinnerware pattern that I chose on a trip to England. It is very elegant bone china with a Montrose shape and foliage and blue roses with gold trim. It makes a romantic table setting. For some, rose colors have meaning, so decorating with dinnerware makes it possible to have an never-ending statement displayed in your home for heartfelt atmosphere.